Pining for the Fiords or Waxing Nostalgic? A Mystery Track at Aquia Landing? 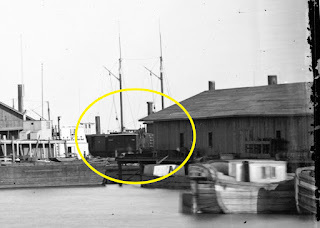 In studying the few photos I have of Aquia Landing for ideas on construction details for structures, I noticed some freight cars in one photo in an odd place. 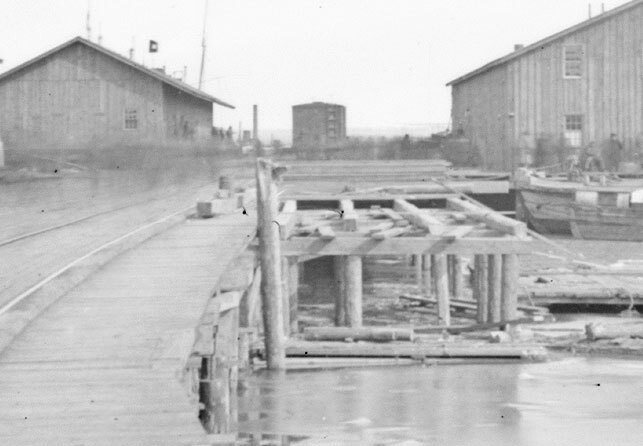 I had noticed those cars before, but I did not fully realize that the cars are on the north side of wharf adjacent to the warehouse closest to the shore. I base this on the fact that the cars are in front of the warehouse. But it is hard to tell exactly, as the edge of the freight car is right on the line of the corner of the warehouse. Is it in front or behind? That is the key question. The yellow circle shows the cars to which I am referring. This appears to be a single track. The next photo shows the double track running down the full length of the wharf. I had always thought the cars in question were on the double track siding. But then they couldn't be on the obscuring the north side of the warehouse, as the double track is on the south side of the warehouse. Could there be a third track on the wharf, a single track on the north side of the closest warehouse? The photo at the bottom shows where I think this track could be. So if there was, what to do about it? 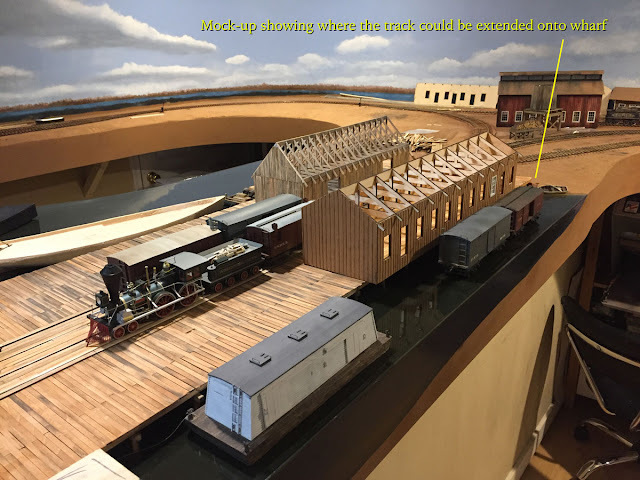 In looking at my track plan, I concluded that I might be able to include this track by extending the current track I call the bakery track onto the wharf. I would have to widen the wharf a bit, but it is possible. 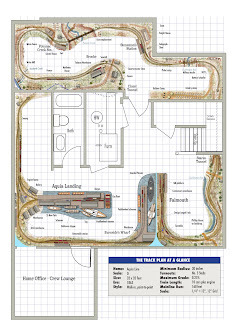 The revised track plan below shows how it might be implemented. The other thing that is becoming more apparent to me is that the wharf has much more of a L shape than I planned. It may be possible for me to make my L shape larger. We'll see how that works out. Is this the site of the mystery track? It was a busy weekend with work on various projects. First was a photo shoot for a potential book project. In the process I took some fun photos. The shot above shows engine Haupt being watered. O scale is big and detailed enough that you can actually remove the tender's watering filler cap and place the water hose in it. Then one can hit the sound function to simulate the water gurgling. An editor from an N Scale magazine once said to me, "O scale is like playing with action figures." He might be right. After that, I got my new laser cutter, a Epilog Zing 24 with 40W, set up. The new laser cuts really well. It's nice to be able to cut 24 inch long material now. With O scale models the extra size is handy. The former laser, an Epilog Mini18 25W, was about 12 years old. It still worked well, though the laser tube had lost some power. I plan to sell it. It's in very good condition. It would be a great way for some one to get started with a professional grade laser cutter. Send me a note if you are interested. The old laser cutter used a 15-year Dell laptop with Windows XP. It was missing some keys and the battery was dead so it had to be plugged in to work, but it still worked. Nonetheless, it was time to replace it. I ended up with an HP Envy 2 in 1 touch screen laptop with Windows 10. Epilog lasers work best with CorelDraw on Windows OS, so I got a Windows 10 machine. I also got a Bamboo stylus, which makes drawing on the screen much easier. The laptop also came bundled with MS Office. My current laser cutting work flow is to do my design drawing in Adobe Illustrator CS5 on my iMac. Then I send the file to my laptop for import into CorelDraw. From CorelDraw I can print to the laser or use the new (to me) Epilog Job Manager. My old laptop did not have the Epilog Job Manager. The Epilog Job Manager.software is really neat. It makes setting up the cutting jobs much easier to organize and to tweak settings. Back to the work flow, Adobe went to an expensive subscription service for their software so they are no longer supporting CS5. I have been experiencing trouble with Illustrator and In Design on my iMac. I don't wish to upgrade to the Adobe subscription service. So I am learning to use CorelDraw in more detail with the idea of dropping Adobe Illustrator. It's a shame as I really like Illustrator, but their subscription costs are too high for a small business. The nice thing about CorelDraw is they provide a complete suite including photo edits in their one price package. So far, I like drawing on the screen with the stylus in CorelDraw. The last project of the weekend was to finish the wharf warehouse. I added a tar paper roof with battens. Then I added doors. The building is done except for some weathering and interior detail, which will be very minimal as the interior will be difficult to see. This building is pretty big, about 18 by 10 inches. But I like the chunky look of O scale structures. Now I just need some more action figures. I am relaying this message on behalf of the staff of Railway Modellers Meet of BC. I'll be presenting a couple talks at this meet. They are happy to announce that registration for the Railway Modellers Meet of BC at the Burnaby Campus of Simon Fraser University May 4th to 6th, 2018! is now open. Some activities like the operating sessions have limited capacity, so sign up today to make sure you don't miss out. Invite your friends and make a great road trip of it! In my case, a really long road trip! Features of this year’s meet will include model and prototype clinics, self guided layout tours, operating sessions, and model displays. I will be presenting the key note talk, which is entitled "High Tech Approach to Modeling the 19th Century." I will also be presenting my talk on waterfront terminals entitled, "Down to the Sea in Trains." 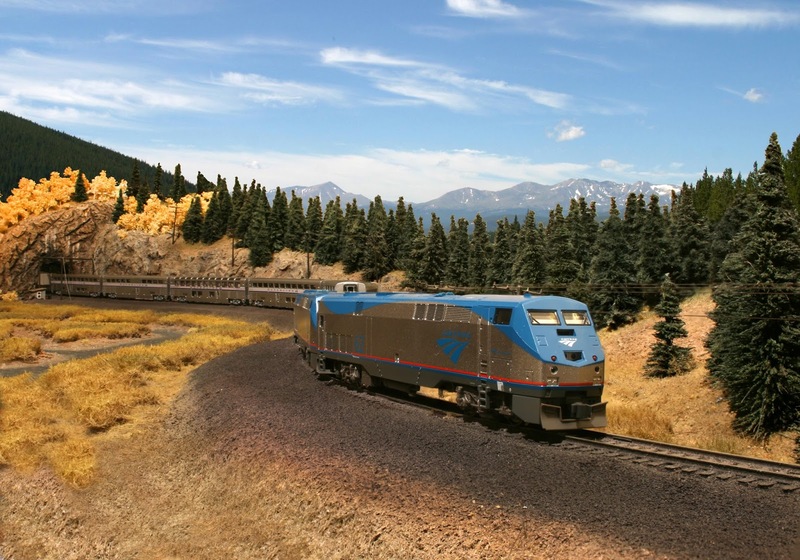 They have a full line up of great clinics http://railwaymodellersmeetofbc.ca/node/668 . This year they have three clinic rooms and will repeat most clinics so that attendees can avoid having to make those difficult choices between clinics that plagued us in previous years! I've been jonesing to build the structures at Aquia Landing, but "real world" stuff keeps getting in the way. One of the more interesting "real world" tasks was a laser cutting pro bono job for a local middle school STEM class that is doing an aviation project. They need a batch of balsa wood glider models for an aviation class. 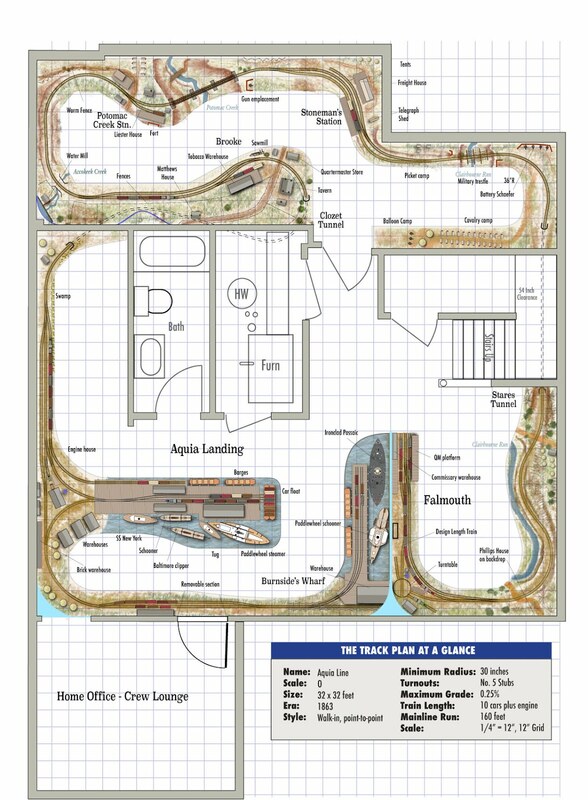 The plans are available on-line. I cut 31 sets for them. It wasn't difficult, but it took several nights of feeding the laser. I enjoy supporting STEM education. That's why I've sponsored high school robotics teams in the past and did this project too. I am amazed at the level of technology these kids are doing in high school. Despite house work, family chores, getting sick, and filling Alkem Scale Models orders, I was able to get a start on one of the warehouse buildings for Aquia Landing. I decided to make a plywood core that I covered with red cedar self-stick veneer. At first I was laying individual planks. But I found if I used a solid sheet of cedar and added the battens one-by-one the look was the same as if I used individual planks under the battens with about half the work. I'll have to remember that as I do the other wharf buildings. The windows are Tichy O scale castings. However, I ran into a question, how to do the roof. In looking at the few photos I have, I'm pretty sure they didn't use shingles. In fact, the photos almost look like tar paper, or painted canvas. What do you think? I don't think they had tar paper in the ACW, so should I go with painted canvas? 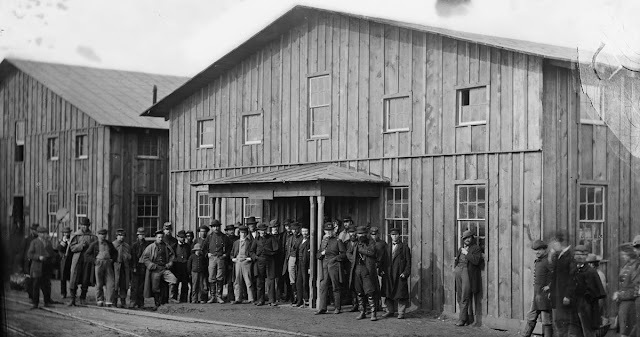 Note the crude construction of the warehouses. There is little trim and none of the battens are straight or of consistent width. The roof on the back building looks like painted canvas or tar paper with vertical seams to me. If you look closely at the edge of the roof of the right hand building, you can see the purlins, and a thin layer on top, too thin to be wood shingles. I always wondered about this photo. The archives says it was at Aquia Landing, but the brick building in the background had me stumped. 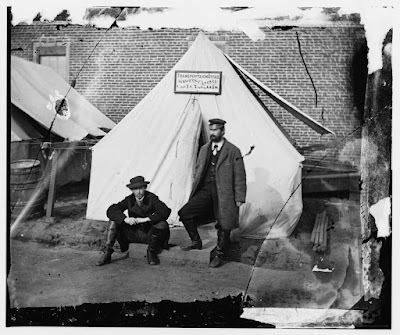 I examined the photo below in more detail and concluded that the "Transportaion" (sic) tent in the left image was one in the line of tents in front of the red building in the picture below. The features of the two buildings match, as do the tents. So the mysterious brick building is probably the one I colored in red below. What is the origin of this building and what happened to it, I don't know. But I like the fact that I can add a brick building to Aquia Landing to help add some variety to the mostly wood warehouses. Every now and then I get an email about one of my former layouts that had been published in various magazines. These notes usually lead to a moment of nostalgia and what might have been. The most recent note was about the N scale DRGW Tennessee Pass layout. That layout was featured on the cover on Model Railroad Planning in 2006. It was that article where I first discussed the Layout Decision Matrix to help one decide what layout to build. I disassembled that layout around 2008, then started a building an N Scale C&O Mountain Sub layout that incorporated my oNeTRAK modules. The photo at the left which shows the Afton module being rebuilt into the home layout. I ended up selling those modules to a fellow in the Chicago area. He never used them, as he switched to S scale modeling. I don't know if they are still around or not. 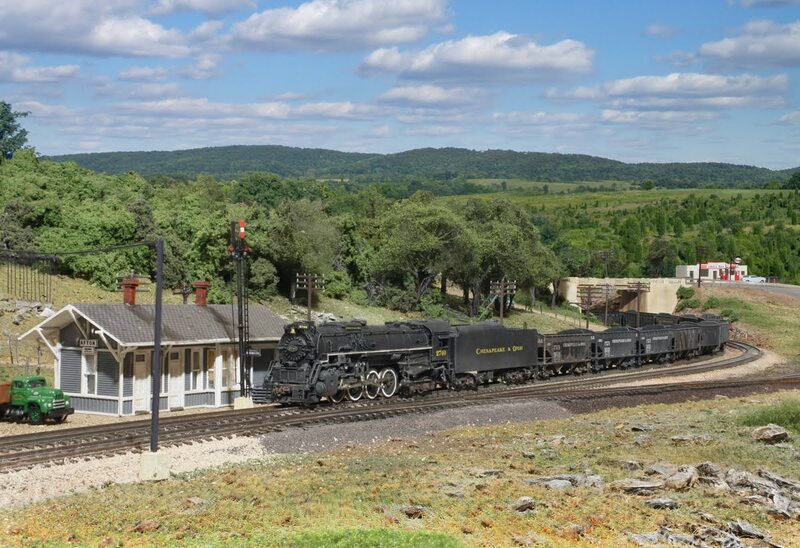 I did get some great photos of the finished portion of that layout before selling it. It was featured in Great Model Railroads in 2011. When I halted work on that that layout, I launched the Aquia Line which I am still building 9 years later. 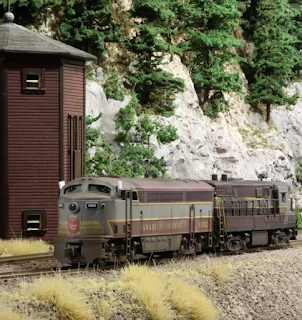 I kept a small 8-foot section of the Mitchell Curves area of the Tennessee Pass layout. And we have used it as a prop for photos over the years, for example the lead photo above. But, mostly it is collecting dust in my garage loft. I have most of the rolling stock and many of the pine trees from the layout. One of these days I plan to do something with them, but I have not decided what that will be. William pulls some cars onto the wharf while his dad, Sean, looks on. Each year about this time, I get recruited to help my neighbors' children with their Pine Wood Derby entries. Today, 9-year old William Heather and his father, Sean, stopped by the shop to use my drill press to drill holes in William's car. He hasn't designed it yet, but he knew roughly where he wanted the holes as they will be filled with weights. 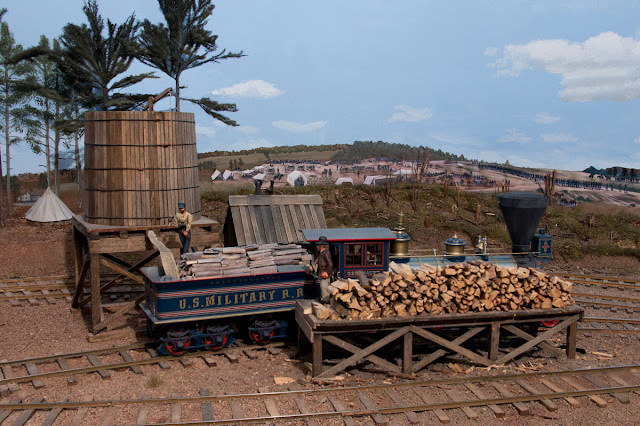 Since the drilling job didn't take too long, we put William to work running trains on the Aquia Line. He quickly got the hang off being the engineer, while I was his conductor and brakeman. Dad watched and offered advice. He suggested a humidifier for the basement to help with the seasonal contraction issues that the layout experiences. It actually isn't a bad idea. If we replace our HVAC system, a whole house humidifier is a good option to add. In the meantime, I may look into a localized humidifier. Sean also agreed to act as a PoC to organize an open house for the local neighborhood kids to see the layout. We have over a dozen kids in the neighborhood now that are just the right age to get them exposed to model railroading. Meanwhile I have been working projects for Alkem Scale Models, and some more track plans, including some for home and some for my next book. Here is a revised plan for v19. This flips the peninsula for Robert's Ridge. 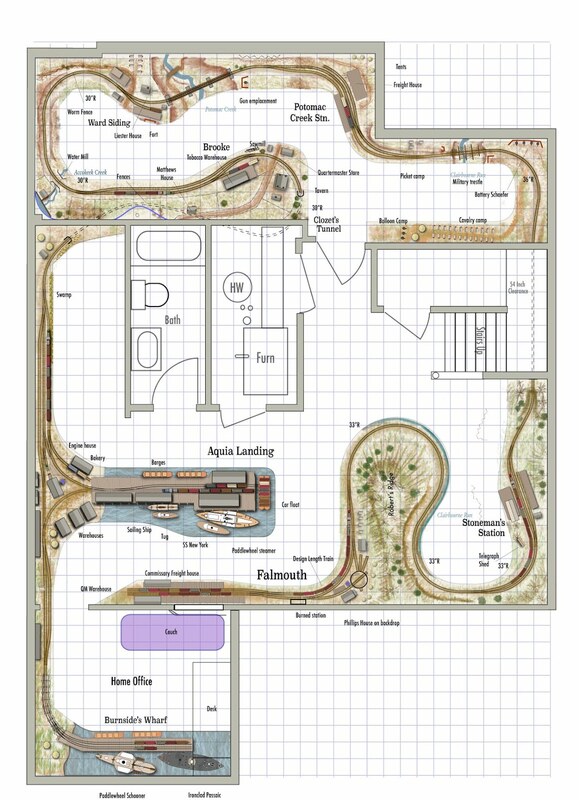 If I were to extend the layout into my office, I think I favor this plan over v19, but I don't think I want to invade the office. So V18b is still the leading candidate.